To discuss the sale of your home, call David Delgado at 562-252-7889 and start packing! We sell our clients homes for an average of 2.4% more money compared to the average area agent. On a $500,000 home, that's an extra $12,000 more money in your pocket. We sell our clients homes on average in only 29 days while the average area agent sells theirs in 62 days. In fact, we sell over 10x more homes than your average area agent. Because we sell so many more homes than our competitors, financially there are extra things we can do for you that other real estate agents and brokers don't offer: Your home will get far more exposure, Your home will be exposed to buyers in a much larger area nationally and internationally, Your home will sell fast and for top dollars because of our unique and exclusive consumer programs. To discuss the sale of your home, call David at 562-252-7889 and start packing! 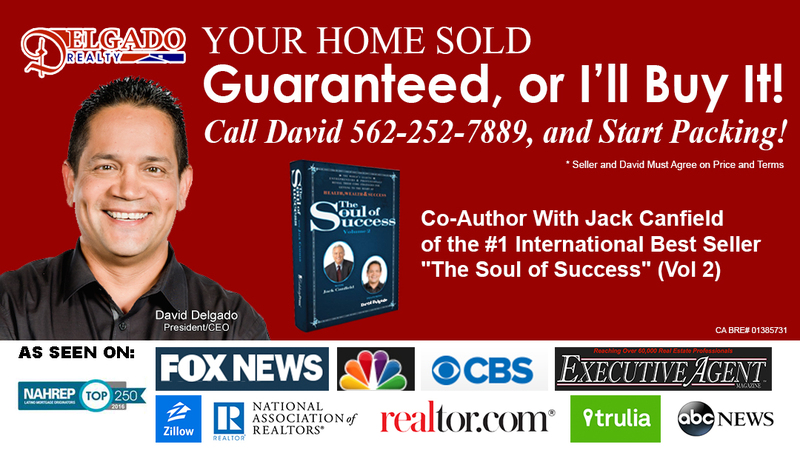 David Delgado is an author, speaker and throughout the real estate industry known as a marketing expert. Our comprehensive real estate website offers direct access to the latest properties for sale and features community information, consumer links, school information, free reports, answers to commonly asked real estate questions and more. *Conditions may apply, call for details.